Roses Naturally ensure every care is taken from the picking to the delivery of your roses to your door. We only use express refrigerated transport so our roses get to you in prime condition next day whether you are in Sydney, Brisbane or Newcastle. This way you can enjoy exquisite fresh rose flowers perfect for weddings or any functions, at a super cheap discounted price direct from the rose farm. Most of our roses are picked as YOUNG EARLY tight colored BUDS -so they have the longest life left to open up for you to enjoy. Some are a little more open, ready for customers who want them more open straight away. * Note that to specify opening the order is classed as a specific order. * Normal orders can be a mix of all openings but mainly from early to mid. Preference for a certain opening can be taken, but match will depend on what is picked that day. to get the best quality and longest life from your roses naturally premium roses. 1.Start with a totally clean vase. It cannot be overstated how important this is. Cleaning with bleach etc is crucial to remove residual bacteria from your vase that will ruin your new roses. 2. Remove the cellophane wrapping and any leaves that a﻿re below th﻿e waterline (they break down and contaminate the water and decay the roses). 3. Trim the stems 1-2 cm (trim on an angle to increase surface area for water uptake and under water to avoid air embolism) Trim every 1-2 days depending on your enthusiasm. This removes the decaying end of the stem so a fresh stem end can more effectively continue to hydrate the rose. 4.Add “Fleur” or " Chrysal" top quality flower food water enhancers to maximize the life and quality of the blooms. 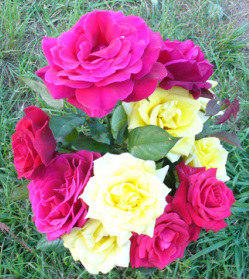 These are far safer than any sugar/vinegar recipes as the professional flower additives are exactly measured compounds to provide nutrients to the roses, balance the ph optimally and inhibit the bacteria that ultimately decay the rose stem until the rose cannot uptake water and dies. If you have a recipe you have used with your water for years that works great then that is proven for you and it would be fine to continue using it. But otherwise, it is very dangerous to your wedding roses to use sugar as food or vinegar to change the ph or bleach for bacterial inhibition as you need such tiny amounts that if exceeded actually cause the opposite effect and quickly kill off your new fresh cut flower roses. Always by far the best option to is use a top quality flower food water additive. 5. The cooler and darker your fresh rose flowers are the longer they will last. Keep away from direct sunlight, tv's and fruit. Fruit releases ethylene gas that causes the roses to accelerate their expiry. The cooler/darker it is the slower the fresh cut rose flowers open and the longer they last. This is one of the most important factors. Alternatively where buds are wanted full and open for that day, leaving them at normal room temperature in moderate light will stimulate them to open more. 6. Every couple of days ideally trim the stems and replace the vase water with fresh water after the vase is cleaned. You know if you have left it too long if the water is cloudy or discolored. Unfortuately you are too late and the bacterial levels are such that your fresh roses are unlikely to survive. Trim them, clean their vase, give them fresh water and they may partially revive. 7. How do I handle them? be very careful not to squash or even touch the rose heads/petals on anything. Any time the petals touch something they bruise and this results in brown discoloration of the petal in a few hours. If it is only light bruising you can just remove the outer petals and the rest of inside will be protected and unmarked. Our roses are all travelled same day/overnight by express refrigeration. When they are packed in boxes they keep beautifully in refrigeration. But as soon as they are removed from refrigeration they need to be placed in cleaned buckets of water immediately ( ideally trimming the stems first ( see no 3 above). Leave all the arranging and playing with them for ideally 8 hours so they can drink and hydrate first. 9.How deep should the water level be? Every bouquet can have stems that vary in length by 10cm, so ensure the water even in the small posies is at least this deep. Ideally the more water the better as it dilutes the bacteria level giving better quality and length of life. So fill as full as possible so long as the heads are water free ( they will rot if they stay wet) and ideally most of the leaves are not in the water. Roses naturally: Fragrant Premium Fresh from the farm “real” roses, perfect for wedding flowers or for any occasion. Roses naturally home page has a full color slideshow display of fresh fragrant cut rose flowers for weddings, functions, available in bulk, wholesale direct to public from grower. Perfect for DIY weddings, florists, cheaper than any sydney florists. Delivery available for rose flowers to Sydney, Newcastle, Midnorth coast. Gold coast and Brisbane. 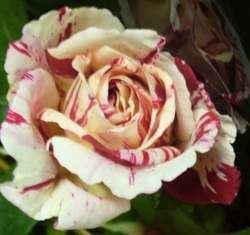 Free and discount delivery for larger wedding rose flower or bull flower orders to metro areas.